On September 19th of every year, current Millbrook students and teachers are not permitted to be on the campus of the school. It is rumored that ghosts of The Battle of Opequon rise on this day to seek revenge on their killers. Unbeknownst to the ghosts, the war is no longer being fought, and so the students and teachers are at risk of being mistaken for enemy combatants. In 2008, the county’s school board decided to launch an investigation into the haunting of the grounds on which the school is built. A professional supernatural investigator squad determined that the ghosts do not pose any immediate threat to the safety of the students and teachers. However, in the spirit of caution, the school board decided to make September 19th “Opequon Appreciation Day,” a local holiday. It happened to show up under the entry for Millbrook High School, just a pebble skip across Red Bud Run, to Stephenson. Now, I know… Wikipedia entries are subject to scrutiny. I’ve seen some train wrecks for accuracy and bias. But, really, when I found this entry on Wikipedia, I wanted to know more. I was skeptical, yet intrigued. So, I started doing some digging. Strange to say, when I found what I was looking for (information from folks affiliated with the school who know better), the entry on Wikipedia was gone. It had already been cleaned-out. Of course, the beauty of Wikipedia is that previous entries aren’t really gone. All one has to do is take a look in the upper right-hand corner of the page, and click the “View History” tab, and start digging into previous entries. In short… the story is bunk, but, I have to give it to the person who took the time to write it… it was creative. Then too, it appears there may be more than one creative high school student (I’m guessing) who likes to work in wikis. After all, I also recall seeing an entry to the effect that 1) students ride to classes on unicorns, and 2) that Quidditch is a varsity sport at Millbrook. Clever rascals, eh? Truth be known, Millbrook High School is indeed on the edge of the Third Winchester battlefield. 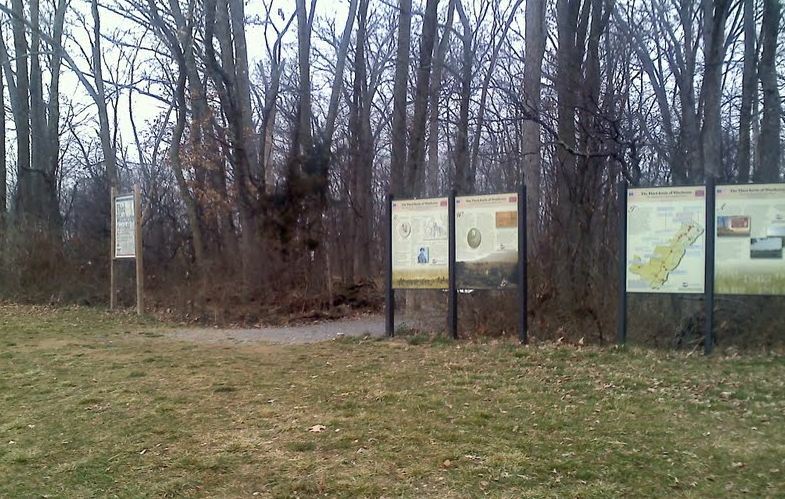 In fact, a trail kiosk is located near the school. 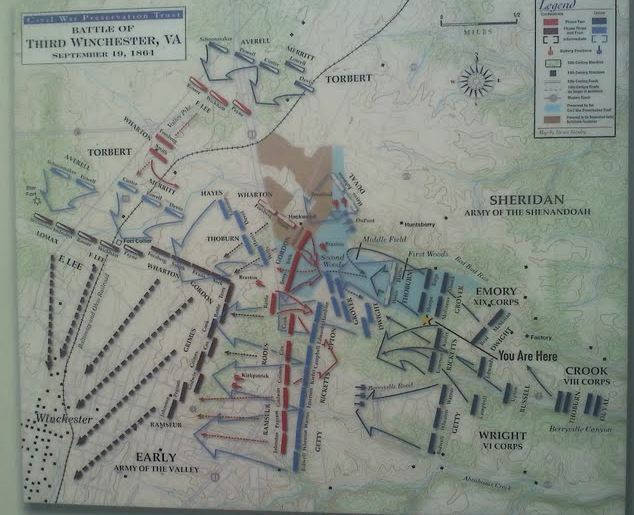 … and, looking at the battle map, one can see that the grounds of the high school was covered by Union forces as they moved against Early’s Confederates to the west… while some seriously heavy fighting also took place just to the north. The yellow star marks the spot where this kiosk is located. Take a look at the troop movements, and you realize this spot was smack between the VI and XIX Corps moving to the front. Riders getting bucked by the unicorns, when the poor creatures are suddenly terrified by Civil War ghosts? 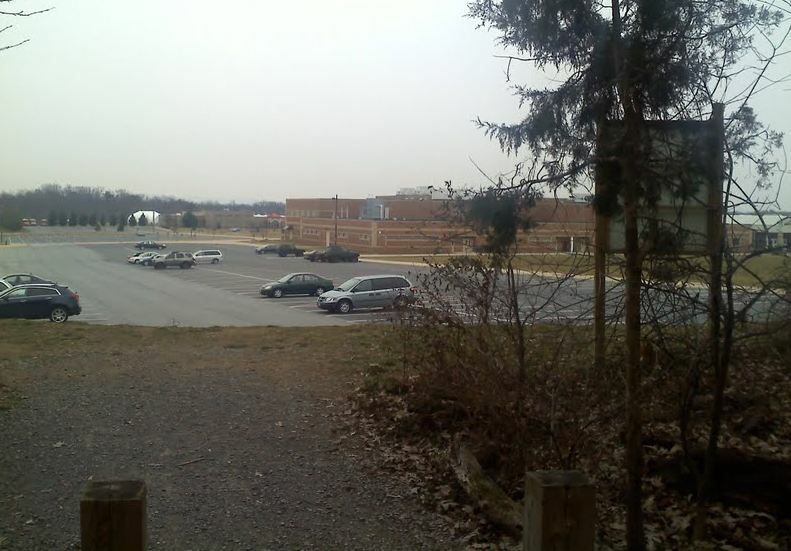 Hmmm…the high school is just south of where my relative advanced with Molineux’s Brigade toward the Second Woods. Maybe he’s haunting them. Interesting post! I imagine some students would love to have a day off, ghosts or no ghosts.